A gratifying work process is just as important as the final result - which is why you should take time to find the right wireframe tools to accompany you along the way. First and foremost, let’s make sure we’re all on the same page. A wireframe is a visual tool that communicates a product’s structure and functionality. In the same way that an architect uses a technical blueprint drawing to plan all the details of a building, from the placement of the gutter to the direction of the door opening, a wireframe demonstrates the layout of a product. It clarifies navigation and explains which elements need to be included on each page or screen (such as buttons, menus and dropdowns). Read more about how to create a wireframe here. Why do we need wireframe tools? Sure – wireframes can be sketched by hand. And in fact, so they should be during the first stages. But once the product develops, a pencil and pen just won’t do. After all, an eraser has its limitations, and interaction, navigation and code aren’t as easy (if impossible) to extract from a hand drawn wireframe. That’s why more sophisticated, high fidelity wireframes are required later on in the process. And that’s exactly where wireframe tools come into play. 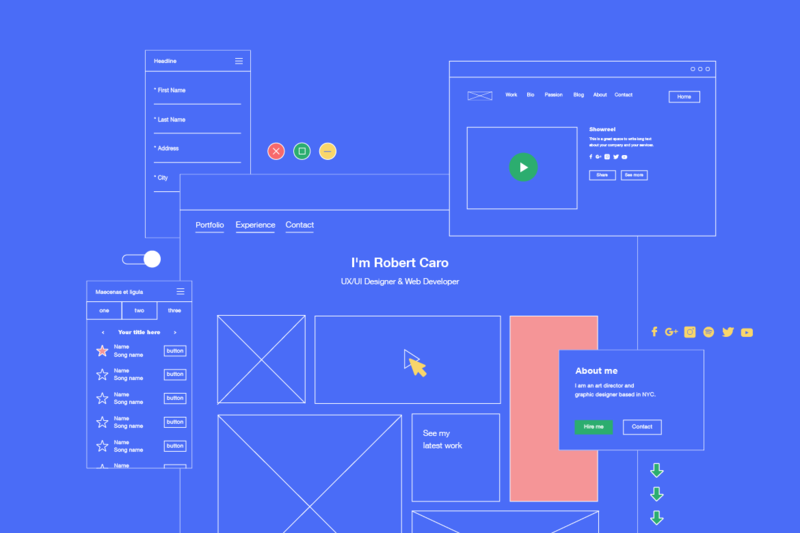 – Are you looking for a tool with which to create low or high fidelity wireframes? – Will you want your team or client to be able to collaborate, share and comment on your work? – Are you planning on creating interactive prototypes? – Do you have your own UI kits or would you rather use those included in the tool? – How will you be delivering your outcome to your developers? When it comes to designing the pages or screens of your wireframe, Sketch offers a very simple interface that enables you to create wireframes quickly. Other than the extensive tools and features within the app itself, there’s a whole community of users that are constantly creating more and more add-ons and Sketch plugins, most of which are free. These help enhance your work process, giving you the option to download UI kits, collaborate with your co-workers, sync your artboards with InVision and more. You can take your project to the next level with various prototyping capabilities, like dynamic text, clickable buttons and basic animations. Presenting and sharing your work with colleagues or clients is easy via Sketch Cloud, as is exporting specs and guidelines for handoff. With the power of Adobe’s ecosystem behind it, this intuitive product balances great performance with advanced functionalities. It lets you seamlessly import files from Photoshop, Illustrator and Sketch – and even automatically transfers symbols from Sketch into the symbol library. These files can also be transferred to Illustrator or After Effects to continue working there. Additional features include the use of AI to automate processes, such as responsiveness and animation, helping you save time as a result. The ‘Repeat Grid’ tool lets you easily replicate elements and update them simultaneously. If working in a team, you can create a library of shared symbols and use Adobe Cloud to manage files cross-team. Ready to bring your design to life? Enjoy all the standard prototyping tools, plus auto-animate, recording preview sessions and even voice commands. This tool is definitely one to watch, as it’s developing at a rapid pace with regular monthly updates and has a growing library of third party plugins. If you’re creating an app or website that requires complex functions and flows – Axure RP is your tool. 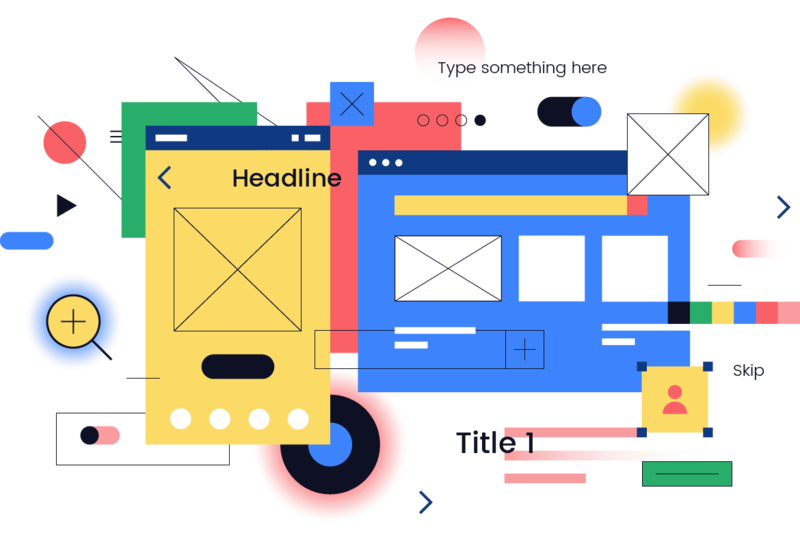 It’s a very powerful platform that enables you to build high fidelity wireframes and intricate interactive prototypes that behave almost like the real thing. This means you can also use your outcomes to conduct usability tests; users will be able to navigate with dropdown menus, fill in forms and “log in,” thanks to the active input fields. Without the need for code, you can add conditions so that the prototype responds to the text that’s being entered, like error messages popping up, or transferring users to the next screen. Additionally, you can enjoy the app’s UI kits and collaborate by sharing a link with anyone while also protecting your work with a password. Similar to Sketch, Figma is more of a design oriented tool, although it does also offer prototyping functionalities. What it really excels in, though, is its real-time collaboration capabilities. A number of people can work on a file at once, adding comments or making quick adjustments. Although there are no pre-existing UI kits, there’s the option to either upload them, or design your own components and save them as a library. You can then share your UI library with your peers, making your wireframes consistent throughout your whole team. Another nice touch is that you can create “color styles” and appoint them to specific elements. When you want to change the color of one of these elements, they will all change automatically. And when you’re done with the design and ready to move onto the next stage, your developers can easily export assets and copy code. Other than having a highly user-friendly interface, Marvel also lets you start out for free, so that you can get a feel for the product before fully committing (great news for the millennials among us). If you’re more comfortable using Sketch or Photoshop, you can import your files from there and then continue working on them within Marvel’s design tool. There, you’ll be able to enjoy millions of pre-made assets, stock photos and icons that are great for using as placeholders in your wireframes. Ready-made wireframe templates are also included, helping you speed up the process. An additional benefit is that you can view your wireframes on all screen sizes, from Apple Watch to iPad, Android devices and more. Lastly, you can add interactions to create prototypes and easily pass on design specs and code to your developers. Similar to Marvel, UXPin lets you start experimenting for free. It gives you the option of importing Sketch and Photoshop files, so that you can transform them into high fidelity wireframes and prototypes with UXPin’s intuitive drag-and-drop functionalities. This tool also includes a comprehensive UI kit, hundreds of icons and symbols that you can adjust simultaneously with just one click. On a similar note, you can also build design systems and share them with your team to obtain cohesive results. When it comes to prototyping, UXPin is very advanced, letting you create interactive form elements. An up-and-coming feature that the more code-savvy UX prototypers among us can look forward to will enable you to import HTML and sync code components. Another new function puts accessible web design in the forefront, letting you view your designs as would people with one of the eight different types of color blindness. Finally, enjoy real-time co-editing and a truly seamless experience when handing off your project to developers. Moqups enables you to create both high and low fidelity wireframes, making it a useful tool to have by your side throughout the process. Like other web-based wireframe platforms, it’s easy to write comments and collaborate with team-members. You can save all your files on the Cloud and enjoy the freedom of working anywhere, without having to upload and download files. There’s also an extensive collection of built-in materials that you can use in your projects, such as a library of icon sets, fonts and widgets that work for both mobile and web design. The easy-to-use interface works with a drag-and-drop functionality. Other than developing wireframes, you can also use Moqups for creating diagrams, flowcharts and storyboards. One of the benefits of Mockplus is that it’s fairly easy to use. It works best for low fidelity wireframes and also offers a set of pre-designed interactive functions. You can work with your team members and allocate each person one of four different roles (owner, administrator, member or guest), according to the level of editing access they require. Mockplus lets you see a mindmap of your screens, so that you can get a quick overview of your app or website’s user flow. Speed up your work process with the vast collection of icons and components that can simply be dragged into your canvas. There’s also an option to export your results to HTML and preview the wireframe on a mobile device. This tool is highly intuitive and it almost feels as though you’re sketching by hand. Their website even mentions that they’re “great for non-technical folks,” which is what makes it such a handy tool for people that don’t require the more complex and advanced functionalities that other platforms offer. So yes, they do use the infamous Comic Sans font in their interface and yes, it is a relatively basic tool, but it definitely does what it says on the tin. You can easily create low fidelity wireframes with simple interactive elements that enable you to use your creations in usability tests. It includes a huge UI kit of controls and icons, so you can put your focus on the layout and general user flow, rather than the visual design. 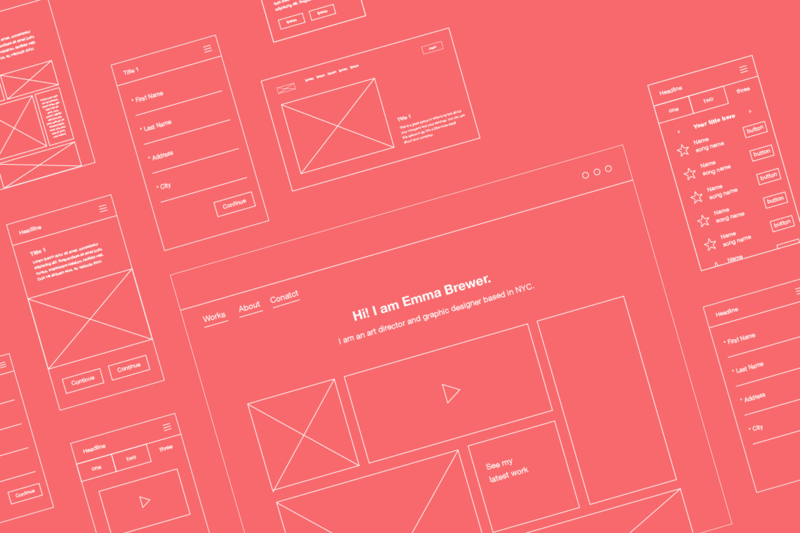 Has all this wireframe talk gotten you inspired? Start off by brushing up on all the major themes that are taking over the field of UX design today.